MONTREAL – Patricia McClintock of Patricia McClintock & Associés enjoys the scope the Hi Connect Design show provides each Spring-it’s the only show where designers can implement their designs. 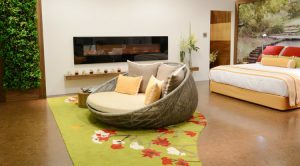 This year, they designed the Wellness guestroom, incorporating elements of feng shui with those of the best spa facilities. 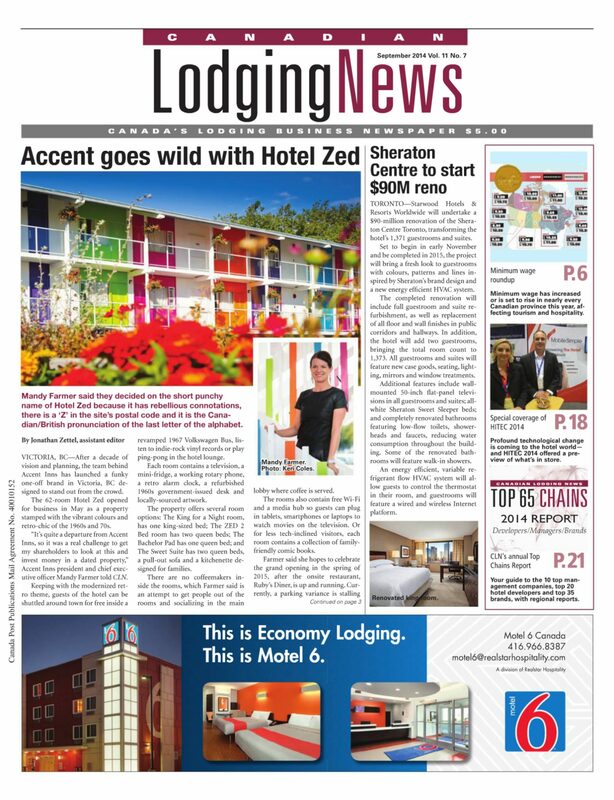 “Guests today enjoy and understand the value of spas,” McClintock told CLN. “Many are quite overwhelmed by communications; their lives are filled with pressure, non-stop. 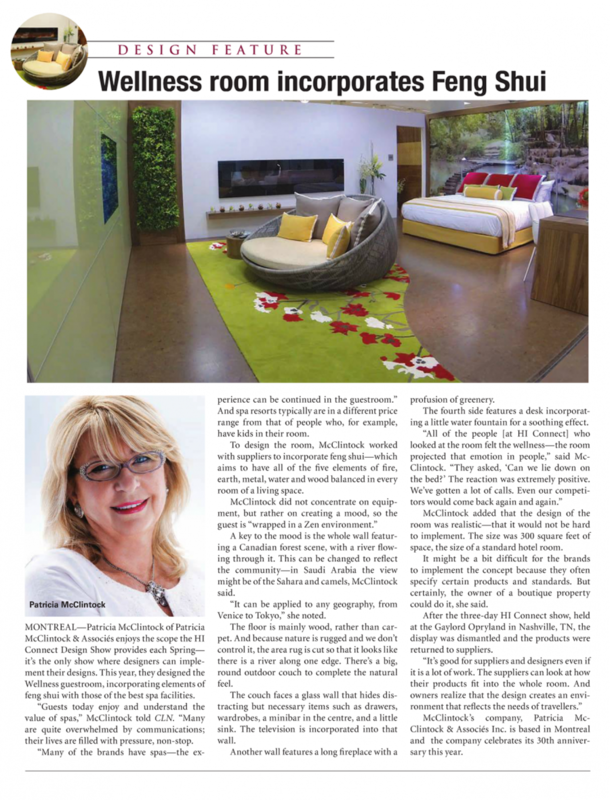 “Many of the brands have spas-the experience can be continued in the guestroom.” And spa resorts typically are in a different price range from that of people who, for example, have kids in their room. To design the room, McClintock worked with suppliers to incorporate feng shui-which aims to have all of the five elements of fire, earth, metal, water and wood balanced in every room of a living space. A key to the mood is the whole wall featuring a Canadian forest scene, with a river flowing through it. This can be changed to reflect the community-in Saudi Arabia the view might be of the Sahara and camels, McClintock said. “It can be applied to any geography, from Venice to Tokyo,” she noted. The floor is mainly wood, rather than carpet. And because nature is rugged and we don’t control it, the area rug is cut so that it looks like there is a river along one edge. There’s a big, round outdoor couch to complete the natural feel. The couch faces a glass wall that hides distracting but necessary items such as drawers, wardrobes, a minibar in the centre, and a little sink. The television is incorporated into that wall. Another wall features a long fireplace with a profusion of greenery. The fourth side features a desk incorporating a little water fountain for a soothing effect. McClintock added that the design of the room was realistic-that it would not be hard to implement. The size was 300 square feet of space, the size of a standard hotel room. It might be a bit difficult for the brands to implement the concept because they often specify certain products and standards. But certainly, the owner of a boutique property could do it, she said. After the three-day Hi Connect show, held at the Gaylord Opryland in Nashville, TN, the display was dismantled and the products were returned to suppliers. McClintock’s company, Patricia McClintock & Associés Inc. is based in Montreal and the company celebrates its 30th anniversary this year.